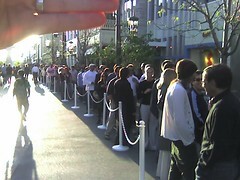 I’ll be posting cam phone images to my flickr account from the Tiger launch at The Apple Store at The Grove. Good times. The best part is they’re lining up at the wrong store. I’m always amazed at line thing….why not just order it online and get it next week…or wait a month. Geez…I guess some people just have too much time on their hands. Ah yes, the perennial online insult: Too Much Time On Their Hands. “I don’t get what you’re doing so you have too much time on your hands.” Usually posted on blogs. Ha! If you’re on the intarweb, you have too much time on your hands. Get over yourself. >I guess some people just have too much time on their hands. I was there too, and I second Sean’s comments. The line really moved pretty fast and there was a pretty decent chance to win stuff. And even if you didn’t win, you at least got a 10% discount on your total purchase which saved me $200 on my new tower. Plus, it’s just fun. Everybody’s been to a film on opening night. That’s not exactly the easiest way to see a film, but I doubt that you’re waiting for everything to come out on DVD before you see it. Ahhh! You didn’t say you could win cool stuff!!!!! That just maybe possibly could be worth waiting in line for….and you’re right 5000, some lines are fun….especially if the people around you are friendly! Previous PostPrevious Holy Ewoks! Nerds second guessing the line!